Providing you the best range of concrete delivery pipes with effective & timely delivery. Innovation is our forte and manufacturing along with supplying of Concrete Delivery Pipes from our side is a strong example of the same. These concrete delivery pipes are made of highly wear resistant material and are seamless in construction. The special flanged collared joints at the ends have stood the test on the sites. Normal pipes with a wall thickness of upto 4.5 mm. are suitable for pumping pressures of up to PN145. Thick walled pipes with a wall thickness of 7.1 mm. are suitable for concrete pumps of pumping pressures upward of 145PN. 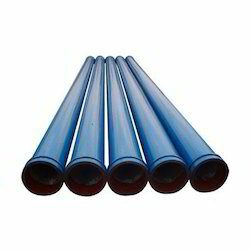 Super high pressure pipes with wall thickness of 7.1 to 10 mm., depending upon the pipeline diameter are suitable for PN200. Normally the bends have a radius of 1 metre, though they can be longer or shorter as per the needs. Looking for Concrete Delivery Pipes ?